There are five themed suites in total, and they launched rather quietly in December 2017, alongside the reveal of the Orange Grove Road hotel’s new Tower Wing refurbishment. Housed on level nine, each suite includes two bedrooms and two bathrooms: the kid's room has its own unique theme and is connected to the parents’ room by a secret tunnel (more of that later). It can accommodate three adults and two children—there is a clever addition of a Murphy bed in the children’s room for a helper or a nanny. The themes are: safari (which is the one we stayed in), castle, space, underwater, and treetops. The safari theme room is the only one that doesn’t feature a bunkbed, which is great for younger Tatlings. According to our concierge, the most popular theme is the castle, but all five rooms are highly sought after so book way in advance for a stay, especially if you’re planning for one during the school holidays or a weekend. We enter our Themed Family Suite through the spacious parents’ room. It looks standard at first glance, then I realise that it has a full-sized Smeg refrigerator and kitchenette (with induction heater and sink) as well as a lovely, cosy dining nook by window that looks out to either the city or the pool. The kid’s room is impressive, and immersive: Our safari-themed room has our Tatling sleeping in a tent-framed bed in front of an African wildlife mural. The tent is outfitted with chino canvas panels strapped up in leather buckles, a hurricane lamp, a mini safari chair and vintage leather prop suitcases. A lot of details weren’t noticeable in the room pictures online, so I was very impressed when we explored the room. A themed room with such fantastic details is sterling, but the amount of thoughtfulness that went into the room is excellent. It truly felt as if parents—not just interior designers or decorators—were behind its creation. Little details like how the floor was not carpeted (but the adults’ was) meant that the floor could be cleaned thoroughly. Other lovely additions include kid-sized table with age-suitable books selected by the butler, beanbags for the kids to jump on, portable cordless night-light on standby and safety covers on power sockets. As for toiletries, there was really nothing I needed to pack. The basics like step-stools, tiny bathrobes and Mustela toiletries were available, but there was more: swim and normal diapers (in the right size), wet wipes, bath sponge, anti-slip mats and a Stokke bathtub. There is also a dedicated family butler as well as an amenity room that is Stokke-stocked and filled with anything that our little family might require: bouncers, strollers, bottle sterilisers, monitors, board games and toys for all ages, night light projectors, thermometers. All guests on this floor have access to a shared pantry too, which includes a washing machine, dryer, iron, induction heater, microwave and hot/cold filtered water dispenser. I didn’t think I could stay within the hotel grounds for the entire weekend’s staycation but boy, was I wrong. Booking the Themed Family Suite gives you unlimited access to Buds, the hotel’s indoor-and-outdoor play space, located on the first floor. Though we’ve visited Buds several times prior to this, our Tatling enjoyed himself thoroughly nonetheless. Buds’ indoor space includes an expansive, two-leveled playground, a series of rooms with activities that include performing, painting, cooking, and even a party room. It also houses a soft-play area for younger kids and (very importantly) a chic café in the middle of it all for parents. Its outdoor space is a further walk out into the lush gardens of the hotel property and features a pirate ship playground and splash pad. While exploring, we found out that the hotel also has family activities in the afternoon, including a children’s movie screening, kid's yoga sessions and a pop-up game space with long-forgotten children’s games like zero-point and five stones. Want to head out? Out-of-towners can use the newly-launched Klook Concierge service to explore and book their extensive edit of local experiences (theme park tickets, walking tours to private yacht charters), meals at over 500 restaurants and even Chi, the hotel spa. This Shangri-La and Klook collaboration has also been rolled out in Hong Kong, Kowloon and Bangkok. There are meeting facilities as well as a dedicated family room with a good selection of toys, Stokke high chairs and even a kid-friendly buffet so that little Tatlings can independently choose their own food. Within the hotel, you’ll find 11 restaurants and bars, that run gamut from Italian at Waterfall Ristorante Italiano to Japanese at Nami. The Lobby Lounge boasts Singaporean heritage dishes by Singapore’s legendary hawkers so you can have your teh tarik, bak chor mee and Peranakan kuehs in style and luxury, or if you’re feeling hungry, head to The Line, touted as one of Singapore’s best buffet destinations. Bring the grandparents along for your staycay! 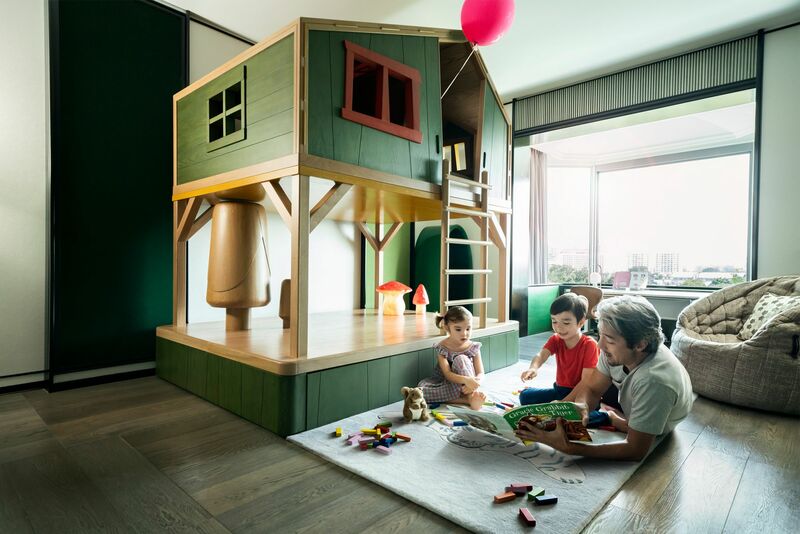 Each of the five whimsical Themed Family Suites can be connected to a Deluxe Family Room to accommodate a multi-generational family or simply a bigger party. An even better idea for a Tatling-worthy birthday celebration: Book the entire ninth floor for yourself and your entourage, have the hotel's bakery Shophouse sort out your 3-d cartoon cake, then blow out the candles in the party room at Buds while allowing the kids to run amok.